An exclusive broadcast will take place tomorrow evening with the winner of the $102,000 buy-in Super High-Roller, ‘bencb789’. This broadcast will feature a live discussion of the key hands of the $102,000 event that he won, questions and answers from viewers on all topics, and general discussion about playing at the highest stakes of online poker. Viewers will be able to send through hand histories using PokerStars’ Boom! hand re-player, and receive feedback and advice from him. The amount won by ‘pappadogg’ from the Czech Republic in the WCOOP $215 NL Hold’em Players’ Choice Event on Saturday. The player cashed $52,265.58 plus a further $4,176.81 in bounties and a WCOOP title. A maximum reward of $5,000 is up for grabs in the PokerStars New Jersey free Mega Bonus Cash Reward promotion. Players need to make a deposit of $30 or more using the bonus code ‘CASHMEGA’ and the player will receive a Mega Bonus Cash reward in their account. Mega Bonus Cash Rewards are allocated randomly and range from a guaranteed minimum of $5 up to a maximum of $5,000 in cash. This week Joe Stapleton and James Hartigan interview PokerStars Team Online member Felix Schneiders. Freddy Cruz aims to out-wit Joe in a round of ‘Superfan vs Stapes’. Days to go until Lads Night In. PokerStars and leading men’s health charity Prostate Cancer UK, are joining forces for a special one-night event in a bid to raise awareness and funds to help beat prostate cancer. Lads Night In will take place on Friday October 21st, 2016, is aimed at bringing friends in the UK and Isle of Man together to hold a poker home game and help raise money for a great cause while having fun. Participants are encouraged to donate the prize pool from their home game to Prostate Cancer UK. Three major jackpots have been hit on PokerStars Casino, with one lucky player collecting almost $1 million! The winners are all long-standing poker players, and show that playing slots on PokerStars is a great way to complement playing poker. For the first time ever the PokerStars Blog have taken a new approach and have posted an audio Q&A rather than written. PokerStars Team Pro, Daniel Negreanu talks about what it’s like to play a big money tournament for the first time. 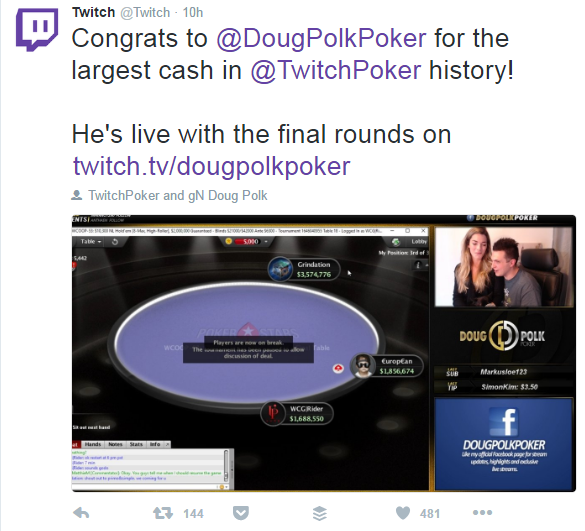 The PokerStars World Championship of Online Poker saw Douglas ‘WCG|Rider’ Polk set a new record for the biggest-ever win while streaming poker on Twitch.TV.